But some agreements to risk money on the outcome of events are enforceable contracts. The day after the Super Bowl, speculators will place bets that stock prices will go up or down, that interest rates will rise or fall, that currency exchange rates will move in one direction or another. If the loser doesn’t pay the winner, the winner can go to court and force the loser to pay. How can we explain the difference? This is one facet of a broader question that has been with us for centuries. There has always been a consensus that investing is necessary and should be encouraged. There has likewise been a near-consensus (one that is weaker now than it once was) that gambling is dangerous and should be discouraged. But where precisely is the line between the two? And what about speculating, which lies somewhere between investing and gambling? To answer these questions, we have always had to distinguish between two kinds of risky transactions, a good kind the law should promote and a bad kind the law should deter. We have drawn that line differently in different eras. In the late 1700s, courts enforced wagers on horse races and presidential elections, but refused to enforce stock sales judges deemed too risky. By the mid-1800s, courts had switched positions on both issues. In the late 19th and early 20th centuries, there was an intense political and legal controversy over whether people should be allowed to risk money on the prices of things they do not own, such as by buying and selling grain futures without owning any grain. Today such transactions are routine. So why did the American legal system, at a very early date, differentiate between betting on sports and betting on the stock market? It wasn’t because one is luck and one is skill. Both have always involved a mixture of luck and skill, and it’s hard to say which involves more of which. It wasn’t because of concerns about corruption. Sports gambling can give athletes an incentive to play poorly and bet on their opponents (or receive payments from gamblers who are betting on their opponents), but stock gambling can likewise give the managers of corporations an incentive to manage poorly and sell the stock short. This was perceived as a serious problem in the 19th and early 20th centuries, and it was handled not by banning stock speculation, but by prohibiting insider trading. The difference between betting on sports and betting on the stock market—and more broadly the distinction between unlawful gambling and lawful speculation—was based primarily on the idea that risk is tolerable as a means to some greater end, but that it’s not a worthwhile end in itself. In the transactions proscribed as wagers, such as bets on horse races and card games, there was no purpose beyond the participants’ enjoyment of the risk itself. The transactions approved as speculation, on the other hand, involved some other useful societal end, even if the risks associated with speculation were indistinguishable from the risks associated with gambling. 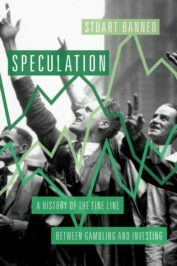 Speculation in trade made society richer, even if it made half the speculators poorer. Speculation in corporate shares gave rise to valuable new enterprises, even if it beggared some of the shareholders. The line between speculation and gambling was often difficult to draw with precision, but this was the intuition behind the widespread view that some such line had to be drawn. Such lines have never been permanent, however, and this one is showing signs of weakening. As gambling has lost some of its moral stigma over the past few decades, the enjoyment of risk for its own sake has increasingly come to be understood as little different from other forms of entertainment. If this slow change in conventional thought continues, it may not be long before wagers on the Super Bowl become just as enforceable as wagers on the stock exchange. Featured image credit: “American-Football” by filterssofly. CC0 Public Domain via Pixabay. Stuart Banner is Professor of Law, UCLA, and author of Speculation: A History of the Fine Line between Gambling and Investing, How the Indians Lost their Land, American Property (Harvard), The Death Penalty, Possessing the Pacific, Who Owns the Sky?, Anglo-American Securities Regulation, and The Baseball Trust. He is based in Los Angeles, CA.